Ear deformities can be distressing for parents because they understand that their child might face ridicule from their peers. As a parent, you want to do everything in your power to ensure that your child has a happy life and grows up to be a confident individual. 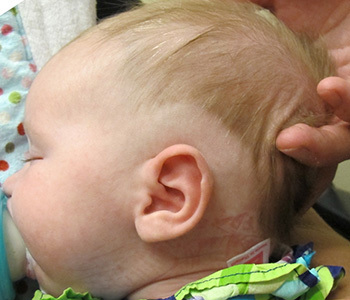 Between 20 and 35 percent of babies are born with ear deformities. Traditionally, doctors adopted a wait-and-see approach because there weren’t any easy, non-surgical treatments available. However, over 70 percent of ear deformities do not improve with age. Fortunately, EarWell™ is a new, non-invasive, non-surgical treatment that can correct ear deformities within the first several weeks of a child’s life. EarWell™ is most effective when applied immediately following the birth of your child. The safe and gentle ear-shaping applicator can be used on newborns as early as the first day of birth. It is important to use EarWell™ as early as possible because the ear cartilage begins to harden with age and can quickly become resistant to molding. EarWell™ uses a non-surgical, non-invasive applicator that is placed around the ears to shape them. During the EarWell™ therapy, an ear-shaped applicator is fitted to your child’s ear. The applicator consists of four parts. A posterior shell fits over the ear positioned against the skin. A retractor is fitted to shape the rim of the ear. A conchal form shapes the center of the ear. An anterior shell holds the applicator together and allows for hearing and air flow. EarWell™ works best when applied within the first five to seven days of birth. If applied during the first 72 hours of life, the applicator usually only has to be worn for two weeks. The applicator is worn for four to six weeks if it is applied during the first six weeks of life. If a child is over six weeks old, the likelihood of success with EarWell™ is very low. Over 90 percent of EarWell™ patients achieve dramatic results and the restoration of a normal ear shape if applied during the first six weeks of life. Prominent ears protrude from the sides of the head and may be disproportionately large to the rest of your child’s facial features. Commonly referred to as “Dumbo ears,” these types of ears are the result of a large concha with a poorly developed antihelix. 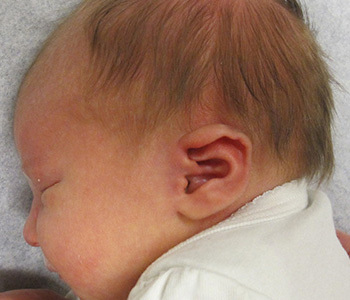 Prominent ear development usually occurs in the early stages of ear development in utero. Lop ear is also known as “cupped ears” or “constricted ears.” The degree of severity will vary among children. Mild forms affect only the helix, in which it appears flattened or folded along the upper edge. The most severe form of lop ear is when the ear is rolled up in the form of a tube. In some cases, children with severe lop ear experience middle ear deformities that can cause hearing problems. Cryptotia occurs when the upper portion of the ear appears to be buried under the side of the head. There may be other malformations of the cartilage in the upper ear. Cryptotia causes the ear to lack definition and can make it difficult to wear glasses. ( ) How do I know if my baby is a candidate for EarWell™? If you feel that your baby may have an ear deformity, talk to a medical professional. It is important to get your children evaluated as soon as possible so the EarWell™ is effective. ( ) Are there any side effects? There are no side effects associated with EarWell™. However, some children may experience some mild skin irritation for the first 24 hours of wearing EarWell™.